I admit, I wouldn't mind seeing Tanev up. Ebbett taks Mancari's spot for a bit more speed. Here's to a well played game! Having Alberts in against a speedy Detroit team is scary. Read some of the threads today around the web and people are really looking forward to this game. 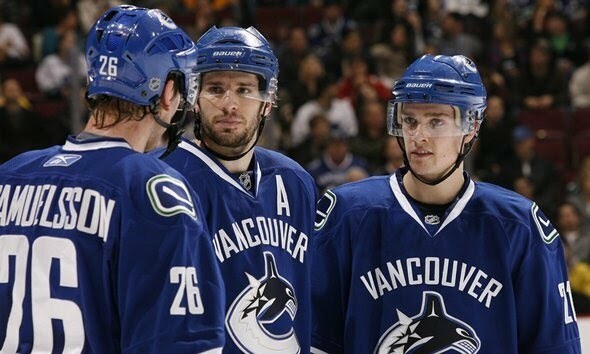 I am seeing a lot of fans who want what the Canucks offer in a team. Skill, speed and fast with heart. They should put on a show with the Wings, who are the one team no one seems to hate playing the team CBC hates. BTW. Milbury needs to go to an AA meeting. I believe Tanev was hit from behind by a Toronto Marlie. It warranted 5 and a game so it's possible Tanev is hurt from it. Beauty of a shot by Hodgeson. Wow! Was that an AHL slapshot or what? Wow. Tough shift by Edler. Edler with two brutal give aways and then Salo falls on Luo after the ensuing lost face off. Pretty set up & goal by Burrows. I don't think Barry Trotz would have liked Bertuzzi's goal - I thought the push-off was an illegal play? Especially when you push the defenceman onto his own goalie? Re-alignment will be good for us, but I'll miss the extra games against Detroit. Raymond continues his strong play. Healthy Raymond = Healthy dose of great play. Hodgson showing off his shot. When the kid connects with that puck he can absolutely rip it. Last edited by tantalum on Wed Dec 21, 2011 9:17 pm, edited 1 time in total. This is going to be one mother effing fast lineup with Booth back. We are starring to see the blue green machine mode we saw last year. That 3-1 goal was huge. Hank wrote: Wow! Was that an AHL slapshot or what? And with his AHL speed he should have been 3 steps behind.